Use this 14" Metal Slatwall Bracket to hold up shelves that you can store all of your various products and merchandise on. 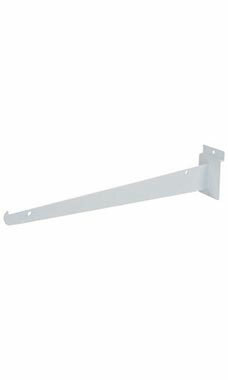 These Brackets are very easy to attach to Slatwall and are applied just like any other Slatwall accessory. The eye-catching white finish looks stunning and will fit just right in to any setting you put it in. This 14" Bracket is an absolutely fantastic deal and you will not be able to find this low of a price anywhere else. In stock and available for immediate shipment. Brackets are easy to use and hold shelves great. Just needed more then I planned. Use 1 every 8" to better support shelving and materials stored on them.